This classic Korean folktale is similar to Cinderella. 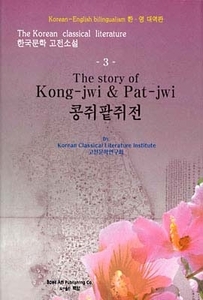 Kong-jwi lives alone with her father, a widower. He is a compassionate man and feels sorry that his daughter must grow up without a mother figure. One day, he brings home a new wife. The step-mother brings her daughter, Pat-jwi with her. The step-mother only loves Pat-jwi and makes Kong-jwi do all the hard labor. When Pat-jwi�s father falls ill and dies the step-mother orders Kong-jwi to do the father�s chores in addition to her usual chores. The step-mother continues to give impossible tasks to Kong-jwi but she is able to fulfill those tasks with the help of her animal friends. Will Kong-jwi�s animal friends and fairy god mother be able to help her with her chores so that she can attend the village ball?